Pretty cool Ernest. Great of you to keep us posted. I was thinking of you today. See my update that i will post here in a few minutes. Merry Christmass. Merry Xmas to all. Thanks Rusty Bike. Trust Santa was good to you and everyone. The other half is in Victoria with her family so getting at this bike has been great. Had originally thought that it was going to be a parts bike, but it has been surprising me at every step. Hope to free up the brakes over the next two days. The more I get done now, the easier it will be when I come back in the spring to take it out west. Will need tires as these are starting to crack even though they are within the date time frame. Still puzzled over the fuel system light. Trust Santa was good to everyone. Turkey for the next week or two as well. -27 deg C this morning. Vehicles started well, thanks for fuel injection, carbs in the cold are a PITA! Short update. Had some time yesterday afternoon before Xmas dinner to do some more work. Neutral indication still working, nice to start the bike without holding in the clutch lever. Took the brake calipers off. One pin in the left front caliper will not, will not come out no matter what I try. Steel and aluminum are not good friends after sitting out for at least 3 1/2 years, maybe more since these were removed for work. Looking for a used left front caliper for the bike - can be from an Aspencade. Any ideas for removing a caliper pin? The rotors are well worn so I will be looking for a set as well. Brakes are something I like to have in good shape. had the rear wheel and FD off. Splines look good, were well lubed. No play in the FD pinion bearing like my pother bike. The spring on the prop shaft FD end is missing, need one before any road test. Everything else looked good. Using anti seize on every bolt/nut that goes back on. Only have a few more days left to investigate/troubleshoot this bike. Have a pretty good idea what has to be done. Have put together a work/parts list for next visit that should get the bike on the road. I have bought a few things here such as a new battery and shop supplies to get things going. Other than this it has been my time. Now to keep this updated. Using anti seize simply because it has been and will be in the frozen cold for the next few months and it has been sitting for a while - hate the results when bolts/nuts don't want to come loose. Milk of Magnesia - who would have thought. Going to hope for the best with the caliper pin. Already have a plan B. Won't bin the caliper but will work on it at my leisure. Heated the caliper housing, and with the help from my brother, an extra set of hands, we got the pin out. Need a new one. Used the ultrasonic cleaner I got for Xmas, water and dawn liquid soap. Didn't do a bad job but not clean enough. Going to put gunk in tomorrow and try it. I bought this for parts cleaning and it is a SS tub. It did clean a bit. Will check the heat setting. May try again, can't hurt. Short update as well. Now that I have the pin out of the left front caliper, it's a clean and new seals that I have but are in Victoria. Will clean the calipers and have them ready for when I return. The bike is also a road bike again. Took it off the centre stand and ran it through first and second in the brother's garage. Only went 15 or so feet in gear but it worked well. Clutch did not stick. Looking forward to the next time I'm here and getting it on the road. I'm also impressed that it is stock, no add-ons. Probably the last update for a while on this project. Time to head south then back to Victoria and some warmth. Put the bike back together last night. Missing the left foot peg, need to source one for when I come back. Installed the centre shelter and everything works as it should. Fuel sending unit thermistor for the low fuel level is gone, will be doing this fix later on, have fuel gauge and all is well. Checked the oil pressure/temperature function - works well and is a good reading. Air compressor system not working - have removed and will take back to Victoria for an overhaul. Will also be able to test it on the other bike. There was air in the system - surprised me when I took off the forward and aft lines from the compressor system and air came out. Refreshed my memory on the suspension. The PO had progressive springs installed front forks, and had the rear air shocks rebuilt. Hope the work was done properly - no oil leaking that I can see. Seat is no worse for wear, needs an upgrade me thinks. All lights work - another good sign. Have my work/parts list started and being refined. Tires and battery are the big expenses right now. Have found a used rear rotor with some life left in it - will be better than what is there right now. Very pleased with the progress and looking forward to a ride across Canada to Victoria. Brother kicked me out of the garage as I am heading south then home to Victoria and he wants his garage back. Took a picture of me and the new bike out in the snow. The lights are on so the bike is running. Drove it into it's cold storage. It's only -24 deg C.
Are you sure that cord has nothing to do with the lights! LOL. Good job Ernest. She's lookin like a riden machine. Getting a bit cold up here -31 deg C, plug in or don't start. More seriously though, doing more perusing of the forums to get a handle on the fuel system light and why it's on. This GL1200 Goldwings forum site: http://www.gl1200goldwings.com/gl1200/a ... rum-7.html has a wealth of information specific to the LTD/SEi FI bikes. It appears that the fuel system light is the catch all "check engine light" for these bikes. The ECU apparently grounds this dash indicator so it illuminates when there is a fault in the system. In my case I have a TPS fault showing up on the ECU regarding a signal error. I have the TPS wiring temporarily installed and will correct when I return. Had that problem with the rear - both pins stuck. Since I was going to rebuild the caliper and didn't care if I fried the rubber inside, I used a torch to heat up the caliper a couple of times and kept squirting WD-40 around the pins while tapping them out and in. Eventually loosened up and I got them out. Stuck them in a drill and used sandpaper to get them below 6mm so they could be re-inserted. (Eventually had to use the grease gun method to get the pistons out). Used heat and with the help of my brother we got the pin out. Have one of the caliper pins that is no longer usable. Will be trying to source a new set, or two. Always good to have a spare. Was able to get the pistons out. Have a few scratches in the first 1/8 inch of the piston, but this area does not impact on the dust/oil seals. Found new caliper pins on eBay - ordered three, gives me a couple of spares. Also bought the Permatex® Ultra Disc Brake Caliper Lube. From what I have experienced, need to take the calipers off for maintenance at least every two years - dissimilar metals do not fair well in our riding environment. Been busy finalizing the parts I need for the bike - have a list and cataloging everything that needs to be sent to my brother. The seat was a bit ratty so I'm having a fellow in my brother's town do a new cover for the seat and backrest - $300.00 is a good deal. The fellow does cars and boats for a living. Doing this is quite exciting. May ship the seat from my bike here for the ride back considering Sonya will be with me, it will be more comfortable than the stock seat, or use a sheepskin - lots of time to decide. Mentioned to my HD friends, who are always surprised when I mention what I will be doing with these older bikes, that this one will be rode across Canada something they will not be able to say about theirs. My parts guy mentioned that a mechanic friend of his has never had an issue with resurrecting an older fuel injected bike, always works after a system clean unlike carbs - more good vibes. Talked with Sonya again regarding this bike. She asked how confident I am about this bike. Once it is mechanically sound, not much else to worry about or do. Also have 350 KM of towing with BCAA, what more does one need. Had mentioned that it would probably be a parts bike, but once it started and everything is working well, and with a good going over, it would be a shame to part it out. Better to spend a few sheckles and sell it - figure I will get my money out of it if I were to sell it once I'm done and have a trip with it as well - 1800 goes first though. We have looked at the trip across, not a lot on the prairies, but once closer to the west coast there is the Badlands, Mount Rushmore, Crazy Horse Monument and the likes. We also have to do a trip back down the coast to the sea lion caves and other areas. There are also more people I want to hook up with, put name to face over coffee, as this forum and the others have been very good to me. Working on my '85 here in Victoria. Will always be a work in progress. Been busy finalizing the parts I need for the bike - have a list and cataloguing everything that needs to be sent to my brother. The seat was a bit ratty so I'm having a fellow in my brother's town do a new cover for the seat and backrest - $300.00 is a good deal. The fellow does cars and boats for a living. This is an expense I did not expect, but good upholstery is necessary if I want to sell this one – not in the cards at this point. The used TPS units that I found are here, will work great in the 1200. Found pins for the one brake caliper on eBay, ordered 3, were here when I got home. Doing this is quite exciting. Mentioned to my HD friends, who are always surprised when I mention what I will be doing with these older bikes, that this one will be rode across Canada something they will not be able to say about theirs. My parts guy mentioned that a mechanic friend of his has never had an issue with resurrecting an older fuel injected bike, always works after a system clean unlike carbs - more good vibes. Have been tracking costs and up to $1800.00 CDN to date. My projection of $2500.00 CDN on the road and travelling is well within reach. 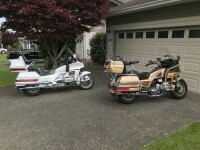 There are two '85 1200 Limited Edition bikes in BC for sale, one wants $4000. CDN the other $5000.00 CDN firm. My $2500.00 looks pretty good. Talked with Sonya again regarding this bike. She asked how confident I am about this bike. Once it is mechanically sound, not much else to worry about or do. Also have 350 KM of towing with BCAA, what more does one need. Had mentioned that it would probably be a parts bike, but once it started and everything is working well, and with a good going over, it would be a shame to part it out. Better to spend a few sheckles and sell it - figure I will get my money out of it if I were to sell it once I'm done and have a trip with it as well. There are also people I want to hook up with, put name to face over coffee, as this forum and the others have been very good to me. Going to use Shinko Tourmaster tires on this bike. Would use Michellin Commander II but since this is the second/spare saving the Michelin Commander II tires for the '85 her in Victoria. Savings of approximately $125.00 using the Shinko tires. Have been in contact with a fellow in Ottawa, Ontario regarding the rear trunk and front fairing. He is making his LTD a project bike and is selling these off for very reasonable prices. The front fairing comes with lights and mirrors, and the rear trunk is not damaged. My '85 at my brother's place has a small chunk out of the trunk top - right rear corner. May also see what he wants for the saddlebags and he has the engine and rear guards as well. If someone does not take these, they will probably end up in the landfill. 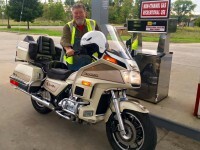 Have had further discussions with Sonya regarding bringing this bike across Canada to Victoria from Ontario. She is not too crazy about the idea because she feels I don't know the bike as well as this one here in Victoria. I think I do, so we have modified our plans a bit. I will go back and get it prepped and ready to go, and ride across back to Victoria. Once back here in Victoria we will use it as the second bike and take off for a few days on the one here. She feels confident in the ability of the bike here considering she has seen me working on it, and being successful at addressing every issue that has come up. Worked on the air compressor system today. A fellow over on the Classic GW forum mentioned that "baking" the desiccant was a good alternative to buying new. Took him up on the advice this afternoon. Heated oven to 350 deg (lowest setting) and "baked" the desiccant for about an hour with good results. Did take the desiccant out and mix it every now and then. Have the dryer back together and tried the compressor, god air flow - has to be better than when I started. Intend to check the solenoids as well by doing a plug and play with the bike here in Victoria. Here are the before and after pictures from the "baking". I have been in electronics since 1958, and several of the companies I worked for, have Desiccant air filters feeding some of their expensive equipment. leave it alone until it is dark blue. we never, ever, replaced the stuff. First time I've done this with desiccant. Now I have to look at the one on my '85 LTD out here. It's probably pink and needs a drying out as well. Dusting the cobwebs off the two regulator/rectifier units I have on the shelf from when I did the alt mod on my '85 LTD. I have the Shindengen SH574AA-12 (shunt type) and the SH847AA from Roadster Cycle (series). The SH574AA checks out good and I believe is a better RR than the Kawasaki unit that is installed on the bike at this time - still puzzled why the OEM unit was replaced. Have sent an email to Jack at Roadster Cycle to inquire if there is a test that can be performed on the SH947AA before I trundle off down the rabbit hole so to speak. I would prefer the series regulator because it does let the rotor/stator operate at lower current hence less heat and still give good power production and delivery. Looking for an appropriate place to install the series RR as it is considerable larger than the OEM shunt RR - nice to have a duplicate bike to do fitment tests. I just read through your thread, good work! I'd probably want to get it back on the road too if I was in your shoes, rather than parting it out. I've been wondering about the alternator conversions (since you mentioned it early in the thread), when you guys do this do you leave the non working stator in or take it out? Can it be removed if you do the alternator conversion or does it have to stay because it holds other parts or things in? It's always a shame when one of these veterans get parted out, but that's progress I guess. Personally I get a great deal of pleasure from working on these, and being able to go anywhere, anytime with my HD friends on their 2017 and 2018 HDs. The external alternator mod is a good alternative to replacing a stator. I have this mod on my bike here in Victoria, adn it actually saved my trip to Los Angeles and back last October. Alternator failed in Redding CA. Had the bike towed to the local Honda dealer, Lee's Honda, and they removed the old, installed the new and had me back on the road in 24 hours - cost was the alternator and 1 1/2 hours labour. Could not have done that with a U/S stator. This mod is not for everyone, but it is one I like. 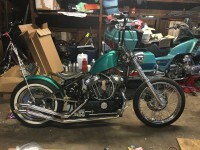 As to removing the stator and electrical system wiring, I had originally taken the engine out of the bike to replace the stator and do other work as well. Once I decided on the external alt mod, I removed the stator - engine was out of the bike and I had the rear cover off. Removed the OEM wiring and rewired to emulate the OEM electrical design as close as possible. I have to admit that I did the install as I expected it to be done, but in hindsight, I consciously missed some steps that I think cost me in the long run. Learned from all of this. To remove the defective stator and wiring is a personal decision. With the '85 LTD and '86 SEi you need to remove the engine to get at the stator. Unless there is a need to remove it, disconnect it from the system and forge on. Some owners install the alt mod and keep the OEM alternator system installed as a backup. Keeping myself up to date. Have almost all the parts needed for the bike. Ordered fuel valve rebuild parts for a Honda ATV. Should work good to rebuild the OEM and get rid of any crud in the valve. The part numbers for this are 16955-HA2-005 and 16963-NB9-005. Made a GPS mount for the bike. Bought a used 350LM for the bike here in Victoria. Had to make a mount for the bike here so I made two of them. Will get the RAM mount and power cord for the Ontario bike. One GPS to use on two bikes, good deal. Still thinking about the external alt mod and having the OEM installation as backup. Considering this because of the wiring nightmare I cut out. Think the RR that the PO had installed is not capable of handling the ampere rating of the '85 LTD rotor/stator: however, will make for a good backup system. Picked up a Poorboy crank pulley a few months ago, have the dimensions for the brackets, and know how the wiring has to go. Hopefully have my brother source an alternator for me. 2 day install I would think, took longer on the one here but it was the first time I had done this install. Seat is being recovered, it wasn't in good shape and travelling some 5000 Kms on a crusty type seat would not be comfortable. Will have a sheep skin with me for the ride across. Have made a GPS mount for the bike. Be able to use GPS on both bikes. Thinking about the electrical hookups that I have to do for GPS, new horns - need to install relay and a few others. Will have this all thought out before I get back to my Brother's place. Have a Shindengen series RR - SH847AA - that I bought for the bike here in Victoria almost 2 years ago. Intend to install it on the bike in Ontario - it will be better than the RR from a 98-'99 Kawasaki ZX6R. Issue has always been the size of this new RR. Won't fit where the OEM install is. Looked at the bike here and found one of the only positions available is beside my right knee position and use the engine bracket bolt holes to secure the plate for the RR. I am using an aluminum plate 4" X 5" by 1/4" thick. Very sturdy. I countersunk the bolts that secure the RR to the plate to give a bit more room when bolting the plate to the bike. Here are some pictures of the install. These series RR produce less heat so the location should be fine. There will be air flow around the back as well as the front - RR is secured such that there is a 1/4" space between the plate and the RR. This is primarily to accommodate the engine bracket securing bolts. The wiring will be routed behind the engine over to the left side of the bike and connected into the system. I checked this RR to make sure it was still good on a Triumph Rocket Touring. It was a plug and play install on that bike because of the Shunt type RR on that bike - same connections. This install was a trial for the bike in Ontario at my brother's place. The more I get done now before I get back to my brother's the quicker the final work will get done. Things are moving along quite well. Nice work. What does your GPS mount look like? Have had correspondence from another '85 LTD owner regarding placement of the series RR. We identified two additional places that would be acceptable for the new RR. The new RR could be installed under either saddlebag just above the exhaust pipes. The exhaust pipes would provide good protection for the RR and there would be lots of cooling air flow. The second location is on the inside upper left corner of the left saddlebag. Lots of room and on same side as stator wiring. 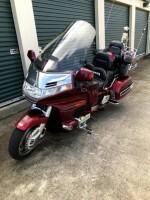 The aluminum plate would be bolted to the saddlebag, and since there is an air gap of approximately 1/4" between the plate and RR, there should be no heat issues with the saddlebag ABS structure. I have routed the GPS power cable into the right fairing pocket where I have 12 VDC switched power supply available.